A lot of folks have lobbed the word "racism" around because it's one of the few (only?) black men shown on a DC cover, and he's portrayed with a gun and a ski mask. Others have come back and said that it's racist to claim that's racist. It's possible there's some racism behind the image -- I don't know artist Doug Mahnke or any of the editors that might've had input into the design -- but without having any insights about the thoughts that went into the image, we can't say. Furthermore, the image by itself is just a single figure, so there's no one we can put Green Lantern into context with. Since racism is defined as "a belief that race is the primary determinant of human traits and capacities and that racial differences produce an inherent superiority of a particular race" there's no way we can show the image is inherently racist. Basically, anyone throwing the "racism" around here doesn't know the actual definition of the word. You might be able to claim there's some bigotry involved. A bigot is defined as "a person who is obstinately or intolerantly devoted to his or her own opinions and prejudices; especially : one who regards or treats the members of a group (as a racial or ethnic group) with hatred and intolerance." 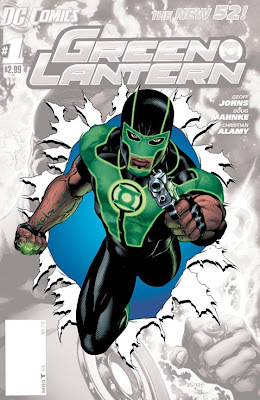 So to claim that there's evidence of bigotry here, you'd essentially have to say that Mahnke (or, again, any editors who influenced the design) was insistent that Green Lantern wear a mask and carry a gun because they firmly believed that's what black people do. Or that black people are thugs and thugs wear masks and carry guns. Something along those lines. Basically that a black person, regardless of their individual characteristics, has to conform to some pre-conceived notion. This is where stereotypes comes from. The angry black man. The sassy black woman. The socially awkward genius Asian. The overbearing Jewish mother. The stereotypes become easy go-to images that we, as humans, use as a sort of mental short-hand to classify people before we get to know them. It gives us a place to start interacting with them from when we don't have any other knowledge about them. It becomes bigotry when we adhere to the stereotype even after we've gotten to know someone, or when we force their words and actions to fit the stereotype. I'm a white guy who's been dating a black woman for over four years now. The relationship has been great, despite us living 300 miles apart. But other people I've known for years longer have mentally assigned her that sassy black woman stereotype, and pigeonhole her comments to fit that mold. Despite four years of evidence to the contrary. There's clearly some bigotry there, possibly some racism as well, and it's saddening to see that kind of small-mindedness in people I know. I can understand how someone might start with the idea of her being a sassy black woman, but four years on? That's bigotry. Right now, we have exactly one image of this Green Lantern. We won't see him in a story until September. The image presented plays heavily into racial stereotypes, especially in the absence of anything else. It could be that the creators play against that stereotype, though, and make readers think about why they thought what they did about the character shown on the cover. That's not infrequently a clever use of the stereotype. Personally, though, I'm not encouraged given the distinct lack of progressive and/or creative thought I've seen coming out of DC lately, but anything is possible. Of course, given that giving a character who already has the most powerful weapon in the universe a handgun is about the most uncreative thing I've seen in a long time -- and even if the gun were a manifestation of Green Lantern's, it's still about the least creative uses for a power ring -- I'm not about to hold my breath for brilliant characterization that plays against the stereotype. And if that stereotype is indeed used, that's still not necessarily bigotry; but it would be not at all creative and very small-minded. Personally, I'm not going to bother looking it up in September to find out. I'd rather take a chance on a comic by some total unknown to me than go with a company that has a long track record of ethnographic obliviousness. Thank you. This is why I read your blog. Objective and coherent. My knee-jerk reaction: between this and that Catwoman cover, DC is either trolling, or just hopelessly inept and screwed-up at the same time. And on balance I don't think they're trolling. I have a lot of deep, rant-y thoughts on this as well. As an Asian-American, people often ask me if I'm offended by the fact that Asian characters are generally just Kung-Fu Masters in comics. My gut reaction/response is, how is it handled? Is it mocking Asians? And if so, is it satirical or a result of pure juvenile ignorance? I can't just (or won't) blatantly throw the word 'racist' around, for many of the reasons you laid out here. Take former American Idol William Hung for example. I had a lot of friends who cried foul and complained that he was simply perpetuating a negative Asian stereotype. But I had to wonder, "Why is it necessarily negative?" William Hung wasn't ASKED to speak with a thick, heavy accent and behave awkwardly. He simply WAS, because he was an immigrant who was still learning the language of the states. William Hung personified the fears and insecurities of every Asian-American-trying-to-blend-in. But can we fault him for that? Perhaps we can fault the corporations who exploited him, but I don't think we can fault him, per se. Of course, that's a far cry from constantly being portrayed as a criminal wielding a gun and ski-mask. I will say this, whether it's racist or not, whether it fits into some special context or not, it's still in pretty poor taste. Just like the 'Bad Girl' era in the 90s. Was it sexist and degrading to women -- even though they were technically empowered super-women? Maybe(probably), but it's just in really, really bad taste. I guess we view the world differently. I don't go out of my way too look for racism or sexism, mostly because I rarely see it to begin with. I know it exists, but it seems like a standard issue statement anymore that's way over used. So what if a comic books main character is black and has a gun and a ski mask? Crime is crime and plenty of whites have used a ski mask and a gun, that's more like what armed robbersin general do period, regardless of race. Like you said, you don't know the guy, but you have no problem labeling him as a racist. I don't know you, but I could easily retort your piece and claim you are merely projecting your racist thoughts and are applying them to someone else, so you can feel better about your guilt. But that would be wrong to do that, because I don't know you. Just because you see something, does not make it so, try to write what you know, it beats the hell out of speculation and no one innocent gets hurt.